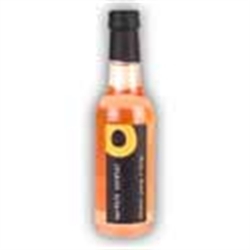 A Supple, elegant and addictive drink with distinct warmth of ginger and dryness of rhubarb, From Norfolk Cordial. Pale peach in colour. Sublime nose of fresh orange zest and grated ginger. Sophisticated yet playful. Dilute:1 part cordial to 10 parts sparkling water. Ingredients: water, sugar, rosehips (0.6%), citric acid, aronia juice. Norfolk Cordial sources top quality, fresh produce from Norfolk farms to make some of the finest handmade fruit cordials and drinks. They use only fresh fruit and flowers to ensure that their drinks are packed full of flavour, Provenance, Quality and Sustainability. They believe that the combination of fresh, salty sea air, rich soils and summer sun make the fruits and flowers of Norfolk some of the best in the country. By using fresh Norfolk produce in their drinks, they can share these beautiful natural tastes, smells and colours with you. It is an adult drink that captures the sharp, the clean, the fresh, the sweet and the vibrant flavours and colours of the fruits and flowers it is made from. Norfolk Cordial offers stylish drinks suited to the cultured adult palate.